Eyeliner has that magical ability to frame your eyes – and if you are using the correct liner, your eyes will look natural and vibrant, without any smudges. 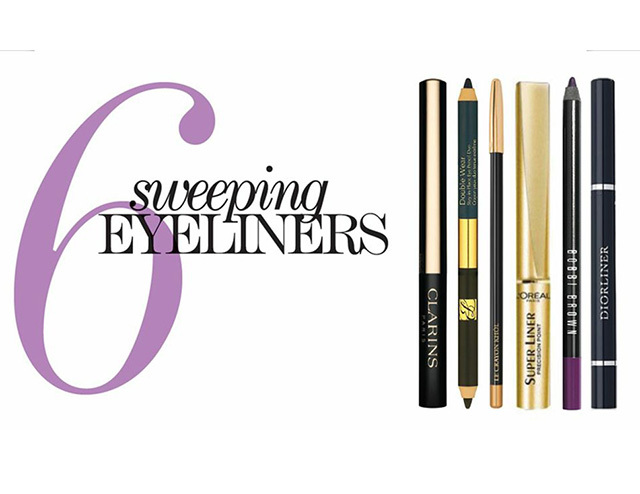 To give you some guidance we tried and tested these six eyeliners; these little beauty pens are perfectly on point. CLARINS INSTANT LINER: An easy-to-apply liquid eyeliner that ensures a precise, long-lasting line, ideal for enhancing the eyes. This eyeliner includes a soft, supple foam applicator which delivers just the right amount of product. ESTÉE LAUDER DOUBLE WEAR STAY-IN-PLACE EYE PENCIL: 2 eye-opening shades in one dual-ended pencil. Long-wearing eye pencil lines and defines with a smooth, even colour that looks fresh all day. LANCÔME LE CRAYON KHÔL: This creamy-smooth eye pencil glides on effortlessly and blends beautifully. In an instant, eyes are perfectly lined, defined and contoured for a smouldering effect that’s irresistible. L’ORÉAL SUPER LINER: A liquid eyeliner in a special sponge tipped pen for the creation of fine lines or thick, sultry flicks. Colour is applied with precision and ease and dries without smudging. BOBBY BROWN’S LONG-WEAR GEL EYELINER: This richly pigmented formula really goes the distance, staying put for 12 hours. It glides on smoothly, for intense definition that lasts all day, so there’s no need to worry about smudging or smearing. DIOR PRECISION EYELINER: Dior’s automatic, total-control pen eyeliner delivers precise contouring and a flawlessly clean line. The click-action applicator with soft, tapered brush deposits just the right amount of fluid on the lids, guaranteeing an even line in just one stroke.